For most school children, Valentine’s Day is a cause for celebration – lesson plans are filled with love-inspired activities, while cards with happy messages are created and exchanged between classmates. But for many Aboriginal school children across the country, thematic programming related to Valentine’s Day – or any other holiday – is something their school systems simply don’t have the resources for. Last month’s Human Rights Tribunal of Canada ruling highlighted the discriminate funding received by Aboriginal schools, especially those in the far North, which lack basic educational resources such as textbooks and school computers, much less art supplies like glitter glue and paper doilies. Laurie Minor, administrative assistant in Laurier’s Faculty of Education and non-status Anishinaabe from northern Ontario, along with associate professor of education, Kristiina Montero, want this to change. With Valentine’s Day upon us, Minor and Montero have been bringing awareness to the discrimination through the faculty’s first annual “Have a Heart” campaign. Inspired by the work of Shannen Koostachin, a youth education advocate from the Attiwapiskat First Nation, their campaign encourages teacher education candidates (TEC) to commit to learning more about Indigenous issues in Canada, particularly those related to education and funding. 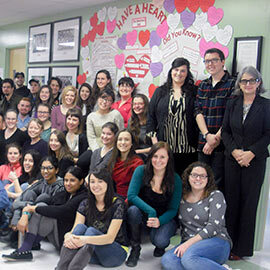 All 58 of Laurier’s TECs, along with full-time faculty and staff, have signed their names to coloured paper hearts, pledging their commitment to learning more and teaching about Indigenous issues in Canada, including those captured in the Truth and Reconciliation Commission’s (TRC) Calls to Action. The pledge hearts are displayed on a wall on the third floor of the Bricker Academic Building alongside the disturbing statistics the duo hope to remedy. Laurier’s Faculty of Education is committed to rethinking the content and subsequent delivery of preservice teacher education so that it will be inclusive of Aboriginal peoples in Canada. Additional details on the faculty’s commitment can be found on their Legacy website.